AC power with battery back-up - ability to expand a current interconnected system or use with existing hardwired only smoke alarms to create an interconnected system. Uses radio frequency to transmit and receive messages about a hazard; when one alarm sounds, all will sound. End of life warning alerts when unit needs to be replaced, ten years after initial power up. Low battery warning. Smart touch button temporarily silences nuisance alarms activated by any alarm in the system; will hush a low battery chirp for up to 12 hours and test the operation of the alarm and interconnected system. 9V battery (included) protects during short-term power outages. MFG #1279-9999. Dual ionization smoke detector for 120V-AC wired-in applications with battery back-up. Interconnects up to 18 units. Battery drawer will not close if battery is not installed. Compatible with old style model no. 86RAC. MFG #9120B. 120 volt A/C. Photoelectric sensors detect smoldering fires quicker. 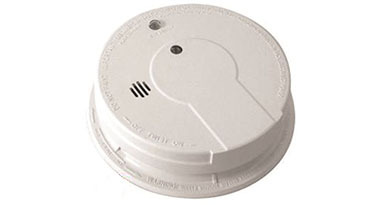 Can be interconnected with up to 12 additional BRK and First Alert smoke alarms and up to 6 different devices such as heat alarms, bells, repeaters, or switches. Alarm indication automatically identifies which unit initiated the alarm. Locking feature to deter removal of smoke alarm. Quick-connect wiring harness. 85 dB minimum, A/C power indicator, and silence/test feature. MFG #7010. 120VAC. Wire in heat alarm that responds to temperature rather than smoke. The alarm will sound if temperatures rise above 135°F. The Kidde HD135F interconnects with up to 24 devices (of which 18 can be initiating) including smoke, CO and heat alarms. MFG #HD135F. Remote visual signaling device. 120VAC 3 wire interconnect. Quick disconnect. Bright 177 candela strobe light. Multi-station capability up to 24 devices. Separate trim ring fits all standard electric boxes. Interconnects only with Fyrnetics and Lifesaver smoke alarms. Smoke alarm not included. 120VAC with 9 volt battery back-up. Front load battery door for easy battery replacement. Quick connect for easy installation. Interchangeable up to 12 units. Continous green LED power indicator. Hush button quiets unwanted alarms for up to 15 minutes. UL 217 listed. Complies with NFPA. With latching LED. AC/DC direct wire alarm with battery backup. Front access battery door simplifies changing batteries. Interconnectable with up to 18 Firex devices. 85 decibel alarm. MFG# 4618. 120VAC wire-in with battery back-up. Single and multiple station carbon monoxide detectors. Interconnectable with other BRK alarms and relays. Meets UL 2034 standard for residential carbon monoxide detectors. MFG #C05120B. 2-in-1 combo provides protection from two hazards. Interconnects with both smoke and CO alarms. Different smoke and CO alarm signals to sound the appropriate warning. Reduces wiring requirements. Single button tests smoke and CO sensor. Alarm announces "Fire, Fire" or "Warning, Carbon Monoxide" along with 85db alarm. "Low battery" chirp. Contractor-friendly installation. MFG #900-0114E. AC/DC CO alarm. Electrochemical CO sensor. 9V battery backup with front pull tab. Interconnectable. Quick connect harness. LED indicators for normal operation and alarm mode. MFG #900900-0120-006. 9V DC ionization smoke alarm. Low profile design. Test button. 85db alarm. This AC/DC-powered smoke detector operates on 120V of power. It also uses ionization sensing technology to detect invisible particles associated with flaming fires. This technology allows the unit to detect these particles sooner than a photoelectric alarm would be able to. However, photoelectric sensing alarms may detect visible particles associated with smoldering fires sooner than ionization alarms would be able to. This Unit Also: Includes a Quick Connect Wiring Harness for Easy Installation. Is Available in a Six-Piece Cut Case with Tray for Easy Display. Is UL-Listed. Has a 10-Year Limited Warranty. 9V lithium DC ionization smoke alarm. 10-yr battery. Tamper resistant. Dust cover. 5-5/8" base. MFG #USL-1122L-6P. 9 Vdc photoelectric smoke alarm. Red LED. Tamper resistant. Small profile.